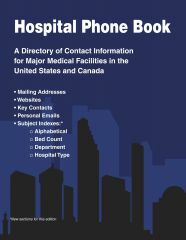 Hospital Phone Book, 52nd Edition provides information on 9,000 major medical facilities across the United States and Canada. Each hospital entry includes full contact details along with the parent company name, hospital and ownership type, and number of beds. The directory also includes over 60,000 of the key administrative and managerial contacts for each institution that are so valuable to marketers and job-seekers, such as, when available, hospital administrator, facility supervisor, and human resources manager, among others. Listings are arranged geographically, and the directory also contains a convenient alphabetical index. Valuable subject indexes allow patrons to target facilities or organizations in specific categories, and access further resources for help and support.